Dhan Vapasi is an idea which seeks to monetise and return the surplus public wealth back to the people of India, who are its true owners. This surplus public wealth is currently locked up in the land, public sector undertakings, minerals, and other public assets. Dhan Vapasi seeks to monetise these assets and distribute the proceeds among the people of India. Any asset that is not being used for providing an essential government function, such as maintenance of law and order, national security, and for providing basic public infrastructure is considered as a ‘surplus public asset’ under Dhan Vapasi. It is important to understand the difference between private and public wealth. Private wealth is the stuff we own – house, car, bike, gold, etc. It is our private property. Public wealth, on the other hand, comprises of the assets that are collectively owned by people but controlled by the government. The use of public wealth is decided by the bureaucrats and politicians. However, our wealth has been constantly looted and misused. The only difference being that after independence, it moved hands from the British to politicians and bureaucrats. After independence, instead of doing the right thing and returning the wealth of the people, the government continued to control our resources. In fact, it acquired more assets. This must be stopped and people must get their rightful share back. How much is the surplus public wealth of India? Preliminary estimates indicate that the surplus public wealth of India is at least ₹1500 lakh crore. This amount is equal to ₹50 lakh for every Indian family of five members. Dhan Vapasi seeks to return this surplus public wealth at the rate of ₹1 lakh to every family every year. It is proposed that the sale of surplus public assets take place in a phased manner rather than in one go – both because it is a complicated process involving identification, restructuring, auction and eventual return which will take time and also so as to avoid any large shocks to the economy. We have tried to arrive at a balance between returning a significant amount to every family ( ₹1 lakh every year) and not to depress the value of surplus wealth. How can Dhan Vapasi be implemented? The Dhan Vapasi Bill, 2018 has been drafted. The Bill and accompanying report elaborate the steps to make Dhan Vapasi a reality. The Bill is available for public discussion and has been circulated to all Members of the Parliament in September 2018. Once in the private hands, won't big corporations end up exploiting these assets? The government ownership of surplus assets does not guarantee their efficient use. It only creates opportunities for misuse and corruption as we have seen in several instances in the past. Most of the public resources held by the Indian government are underutilised, mismanaged and have been subjected to large-scale corruption scandals. These assets, when controlled privately, will be used to create value. This will happen because no individual or corporation will buy an asset without examining its ability to create value. They will be used to set up factories, construct houses, schools, hospitals and more. Who is eligible for Dhan Vapasi? Every citizen of India is eligible for Dhan Vapasi. Why is Dhan Vapasi not limited to the poor? Do the rich really need an extra ₹1 lakh? The public wealth of India is collectively owned by all citizens of India. Thus, all Indians, rich and poor alike, have an equal claim on the proceeds generated from surplus public assets. There are various subsidy schemes carried out in India today, which are basically targeted transfers initiatives that transfer cash to a specific set of people. One of the major issues with such targeted schemes is the high incidence of corruption because of the power with authorities and officials to decide who finally gets the cash benefit and who doesn't. Many times the money earmarked for the beneficiaries does not reach them at all and is in fact, pocketed by corrupt officials on the way. Dhan Vapasi solves this problem by ensuring that this public wealth is returned to not just a few but all Indians and is used in any way they see fit. How is Dhan Vapasi different from the existing government programs? Dhan Vapasi is not just another government program. Unlike government-run programs that target specific groups and barely make an impact, Dhan Vapasi is about returning the rightful wealth to every citizen so that they can meet their needs as they see fit. What will happen to employees of government companies? Employees of the government enterprises will be compensated as per the terms of their employment agreement. The central government has used similar mechanisms in the past while divesting its interest in various companies. Current ownership of a large number of enterprises by the government is a huge drain on the taxpayers. Whenever the government decides to spend on bailing out or running a PSU, it implies that the same amount is not being spent on other, more productive purposes. PSUs are not the vehicle for generating employment and the government ownership of companies also reduce competitiveness which in turn may lead to fewer choices and higher prices for the consumers. What will be the effects of Dhan Vapasi on the economy? Sale of public assets and the subsequent return of the proceeds to every Indian will have an enormous positive impact on the economy. Citizens will benefit directly from the return of wealth, the government will receive more tax revenue because of the increased economic activity. It will also allow the government to focus on providing public goods like rule of law and basic infrastructure. Businesses will benefit from reduced cost of production and a larger consumer base. Additionally, the sale of surplus assets will lead to increased supply and lower prices for assets such as land. For example, newly freed up land could be used to provide affordable housing. Will Dhan Vapasi cause inflation? It is unlikely that Dhan Vapasi will cause inflation. When a huge amount of land and minerals is suddenly made available, as in the case of Dhan Vapasi, the prices of these goods will fall. Individuals and businesses buying recently made available land and minerals will have to divert their income or savings away from other goods and services (whose price will now fall due to reduced demand) to these new ones. Inflation is not an increase in the price of one good but a general increase in the price of all goods. And a general increase in prices is not possible without increasing the amount of money in circulation. If anything, Dhan Vapasi will lead to a reduction in general prices and not an increase. There may be a situation of deflation, but not inflation - given that there is an increase in the number or quantity of goods and services in the economy without a corresponding increase in the quantity of money. Is this like Universal Basic Income (UBI)? Dhan Vapasi has little in common with UBI and is more like a Universal Wealth Return (UWR). 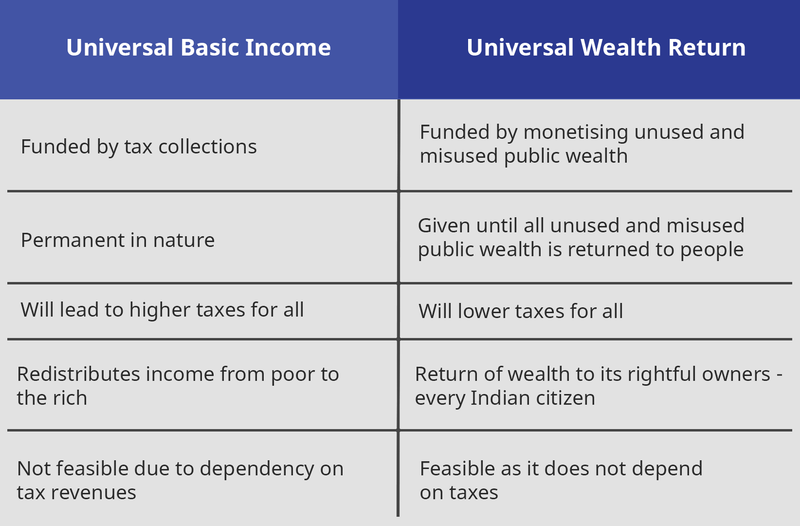 While UBI is provided in order to mitigate the adverse effects of unemployment and as an efficient mechanism for delivery of government subsidies, UWR is based on the idea of returning surplus and unutilised wealth that is currently in the hands of the government back to its rightful owners, the people of India. Wouldn’t ₹1 lakh per family per year discourage people from working? In India (and other countries), multiple experiments have taken place on a small scale, wherein a group of people were given cash directly into their bank accounts. In most of these cases, it was found that this transfer had a positive effect on the lives of people who received it. IIt was found that the recipients of these cash transfers used the additional cash to buy nutritious food which they could not afford before, or to buy household assets like motorbikes and refrigerators, etc. In some cases, the people who received this cash were farmers and they invested this money for improvement of their farms. It also spurred entrepreneurship as people now had some starting capital to invest in their business idea. These experiments with unconditional cash transfers did not encourage idle minds or reduce the number of working hours. In fact, it encouraged women to find work. Please refer to this linkfor a detailed study on positive effects of transfer of cash to people. Further,this video sheds some light on what happens when you transfer money to a poor family in India. While no one can deny that there will be a few people who will become complacent and depend on only the Dhan Vapasi money to get by in life, we can’t not carry forward this process just because of them. Moreover, it will be unwise for the government to continue to sit on this vast amount of surplus public assets while its rightful owners are deprived of its potential benefits. Will Dhan Vapasi bring back black money stashed in offshore bank accounts? No, Dhan Vapasi is not related to black money stashed in offshore bank accounts. Once Dhan Vapasi is done, the politicians, bureaucrats, and the cronies will have little opportunity to profit from the control of our wealth. Who is behind Dhan Vapasi? Dhan Vapasi is not supported or sponsored by any corporation, party or government. Rajesh Jain , Nayi Disha’s founder is an entrepreneur, a problem-solver who has spent the past 25 years of his life solving problems for millions in the world of technology. On wondering why despite 71 years of independence and 16 governments spanning over 3 generations of Indians, we have not been able to solve the triple evils of poverty, unemployment, and corruption, he realised what India needed was a Nayi Disha, a new direction. From this thinking was born the idea of Dhan Vapasi, a practical solution that can make every Indian free and prosperous.